BBG Governor Victor Ashe with Russian human rights leader Lyudmila Alexeeva and human rights reporter Kristina Gorelik. Moscow, June 2013. The Broadcasting Board of Governors (BBG) member Victor Ashe welcomed the House Foreign Affairs Committee hearing Wednesday in Washington on reforming U.S. international broadcasting. Ashe, a former mayor of Knoxville and former U.S. Ambassador to Poland, was the only sitting BBG Governor attending the hearing. In his opening statement, the House Foreign Affairs Committee Chairman, Rep. Ed Royce (R-CA), acknowledged Ashe’s presence in the audience. Speaking at the hearing on reforming “Broadcasting Board of Governors: An Agency ‘Defunct’,” Chairman Royce made a clear distinction between the Voice of America (VOA) and surrogate broadcasters, such as Radio Free Asia (RFA) and Radio Free Europe / Radio Liberty (RFE/RL). Governor Ashe holds a position similar to Royce’s on this issue, sources told BBG Watch, but also agrees with Royce that the structure of U.S. international broadcasting needs a major reform rather than a partial solution. In his comments for the media after the hearing, Ambassador Ashe highlighted the problem of low employee morale at the agency, which is being managed by the International Broadcasting Bureau (IBB) headed by Director Richard Lobo and Deputy Director Jeff Trimble. Ashe’s exposure of wasteful spending and his calls for reforms within IBB have made him an enemy of the agency’s top bureaucrats who, according to sources, may have persuaded the White House to make a decision to replace him. The White House agreed even though Ashe is the only Republican member on the board which should have four Republican members and does not have a quorum. By law, Ashe continues to serve and will stay on the board until his replacement is confirmed by the Senate, which may take several months, sources told BBG Watch. Other current BBG members, Susan McCue and Michael Meehan, both Democrats, work closely with Ashe. They are reportedly also frustrated by IBB’s executive staff. While the attention of Congress is focused on the BBG board, many rank and file BBG employees, mid-level managers, BBG employee union, AFGE Local 1812, and some media freedom NGOs blame the IBB management for making the agency disfunctional and accuse it of being hostile to employees. Until very recently, IBB executives had enjoyed strong support from some of the former BBG members. At least two of former members had private business interests in Russia and China while making decisions on U.S. broadcasting to these two countries which have authoritarian governments and practice press censorship. Rep. Engel was referring to the Office of Personnel Management (OPM) surveys showing that the management of U.S. international broadcasting, consisting largely of top executives of the International Broadcasting Bureau, is rated as being among the worst in the entire federal government. Another House Foreign Affairs Committee member who appeared to agree with Ashe on the need to reform the agency’s bureaucratic management was Rep. Ileana Ros-Lehtinen (R – FL). Speaking at the conclusion of Wednesday’s hearing on the Broadcasting Board of Governors, Rep. Ros-Lehtinen called for replacing the agency’s management in charge of international broadcasts and other news programs. She said that managers who do not understand what U.S. international broadcasting mission is should be changed. Ashe is highly respected among rank and file agency employees who see him as their defender against hostile IBB management and a defender of BBG’s mission and the different missions of VOA and surrogate broadcasters. 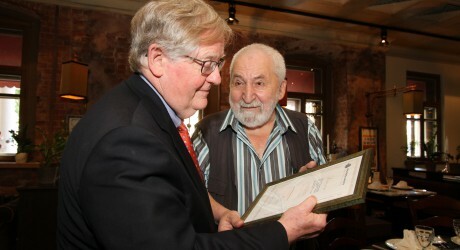 For his efforts to save Radio Liberty’s mission in Russia, after the previous Radio Free Europe / Radio Liberty (RFE/RL) management had fired dozens of experienced journalists and ended their pro-human rights programs, Ashe was presented a certificate of appreciation from the Glasnost Defense Foundation, as a “token of gratitude for his defense of glasnost in Russia.” Ashe worked with Governors McCue and Meehan to change the management at RFE/RL which had been supported by a former BBG member whose company is doing business in Russia and China. IBB executives allowed the Radio Liberty crisis in Russia to develop and continue until the three BBG members intervened. Thanks to efforts by Ashe, McCue and Meehan, and with support of Under Secretary of State for Public Diplomacy and Public Affairs Tara Sonenshine, some of the fired journalists doing investigative and human rights reporting in Putin’s Russia have already been re-hired by RFE/RL under the new management of Kevin Klose. “I am pleased the House Foreign Affairs Committee held a hearing June 26 on the Broadcasting Board of Governors (BBG) as there are serious issues facing BBG which require congressional action to correct them,” Ashe said. “We have lawsuits which could cost the American taxpayers millions of dollars as they relate to Office of Cuba Broadcasting (OCB). They need to be resolved if at all possible and if both sides can work it out.” he added. “I am proud to have attended every single BBG meeting during the three years I have served on the Board. I have visited all the VOA language sections. I have visited BBG transmission stations from Greenville, NC to Udon Thani, Thailand. I have been to offices in Baku, Pristina, London, New York and Tbilisi.” he stated.